This meal is absolutely delicious, satisfying, and flavorful and combines healthy ingredients. Poached eggs make for a warming breakfast, lunch, or brunch. This is an easy, filling, and comforting meal to make for company and the perfect recipe if you are looking for a one-dish meal. It is a beautiful combo of balanced flavors and is easy to assemble. You can experiment and make it differently regardless of the occasion. Whether you need to feed a group or fix something quick for your kids, this meal is tasty and loaded with nutrients. Bring a large pot of water to a boil. Stir water in one direction with a spoon or spatula. Crack an egg into a separate bowl, and pour the egg from the bowl into the water. Repeat for another egg. Cook for about 2-3 minutes until the whites are set but not the yolks; fish them out. Heat water in a bowl and cook the asparagus for 4 - 5 minutes or until tender. Leave aside to cool. Saute the garlic for 2 - 3 minutes, season with salt and pepper, and add dill and lemon juice. 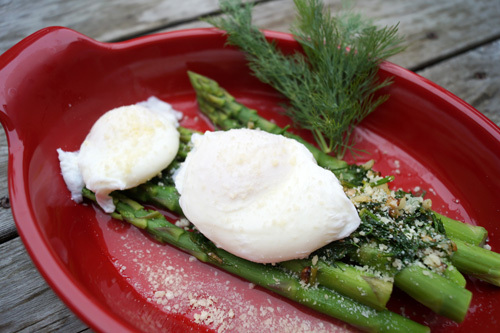 Distribute asparagus in 4 plates, add 2 eggs on top, and pour the garlic sauce. Garnish with Parmesan and serve. Alternatively, you can serve the poached eggs with yogurt and crumbled feta on top.